After removing your Fly Veil from packaging, it may have creases caused by fold lines. 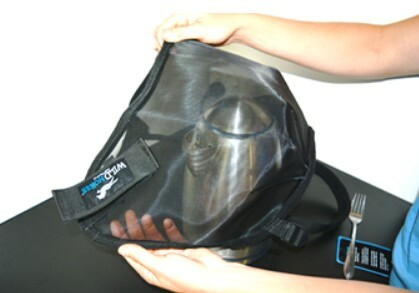 These will fall out eventually but for optimum benefit of our unique design we advise spending just a couple of minutes on steaming which will give you the absolute best clearance around your horse’s eye area. Boil your water jug at home and lift the lid to create continuous steam. When water is boiling, place creased area over direct steam for 3 – 5 seconds. Push the ends of the eye darts out to create as much clearance as possible round the eyes. Beware, Fly Veil will be hot after being over steam. We recommend that the ends of all eye darts are steamed and pushed out at the same time with a utensil (see image below), this helps to stop any inverting of dart ends and creates more of the desired dome shape for full eye clearance. If end of dart is indented gently push out with the end of a utensil while over steam. 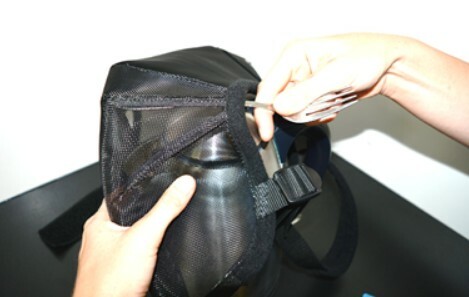 Another way to make the dome more effective is to hold darts as in image below, steam then push out the area between the darts. Steam side creases or creases in the main body of the Fly Veil. For Assistance with this process please contact our team.